Where Water Jets Collide | THERMO Spoken Here! 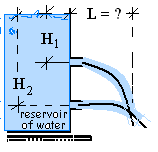 The sketch shows a reservoir of water restrained by a wall. The wall has two openings, one above the other. For the instant shown, jets of water that issue from the holes intersect at a distance, L, from the tank wall. Assuming the flow to be frictionless, the speed of each jet of water issuing from the wall outlet is given by Torricelli's Theorem. Use the geometry to show that the intersection of streams occurs at the distance: L = 2 (H1 H2)1/2. ♦ We will treat the water not as a continuous flow but as a series of discrete droplets that are projected from each outlet. Our system is composed of two such droplets that collide at the presently unknown distance, L, from the wall. Before we can write the "positions" of the two droplets, we must decide upon coordinates, origins and a vector basis. The setup needed is shown below right.